The "Think Tank" Europe-Mexico. EU. It took place on January 29, 2015. 10h à 12h00. Followed by a cocktail . In the Information Office of the European Parliament to France in Paris. 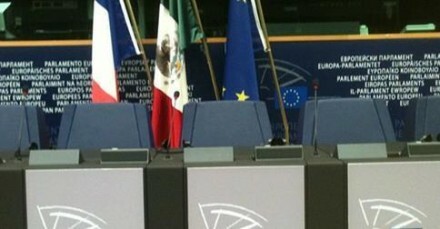 The "Think Tank" Europe-Mexico, was founded in 2008 in Paris, France. Firstly as a Blog (International), it evolved over time in importance, in 2014 to become an association with legal personality. *Mexico will be one of the top economies of the world in the years to come ...! Mexico, Who Chaired the G20 in 2012, is leading an country. 3 times the area in France, + 119 million, an OECD member, the Pacific Alliance ... this is the first Spanish-speaking country in the world and the first trading power in Latin America. The "Think Tank" Europe-Mexico, is a french association that aims to produce and disseminate solutions for public, economic, cultural, political & diplomatic, trade, scientific cooperation technical, ICT & Climate Change in Europe and internationally. Help establish and strengthen ties in strategic areas between Mexico, France, Europe and worldwide. "Thinking the Europe of tomorrow." Being a landmark and meeting place of very high standard of Mexico in Europe. Contribute establish & Strengthen Strategic Sectors links between Mexico, Europe and the World. To promote the prestige and image of Mexico abroad, his diplomacy, with particular focus between Europe and the EU. Support the mission and goals of the project "Talent Network Mexicans Abroad" and the Mexicans abroad Global Network, under the direction of the Institute of Mexicans Abroad (IME), which owns the SRE. Produce studies and proposals in the areas mentioned above. "Think Tank" European and International. France, Europe, Mexico and Worldwide. Capable of generating "practical" solutions and "innovative" to the challenges of today! A "Think Tank" of the 21st century , very high level. Support the mission and objectives of the project "Mexican Talent Network & Global Network Mexicans abroad", under the leadership of the Institute of Mexicans Abroad, belonging to the SRE. The "Think Tank" Europe-Mexico, is a French Association under "Law of 1 July 1901". (N° 1139 OJ). *Morgane BRAVO, President I Founder of "Think Tank" Europe-Mexico. The "Think Tank" is independent of any political party in France, Mexico and Europe. Membership of the "Think Tank" Europe Mexico, may not be invoked publicly at events or in publications, etc., without the express authorization of the President. * S.E.M. Romain NADAL, Ambassador of France to Venezuela. Former Director of Communication and Press. Spokesman for the Ministry of Foreign Affairs. * Mr. Marcel POCHARD, President of the Cité Internationale Universitaire de Paris (CIUP). Honorary Member of the Council of State, former adviser to several Ministers. He Chaired in 2007 and 2008, at the request of the Minister of National Education, the Commission on the development of the teaching profession, known as the Commission POCHARD. He produced a report on the reform of educational institutions and the management of teachers. Former Director General of the Public Service (1993-1998). Chairman of the National Disciplinary Chamber of Physicians. President of the Higher Council of the public hospital. * S.E.M. Francisco GONZALEZ DE COSSIO, Ambassador of Mexico in retirement. Career member of the Mexican Foreign Service since 1973, was promoted to the rank of Ambassador in 1981. In the SRE, was assigned to the Directorate General of International Economic Affairs; Multilateral Economic Relations; Bilateral Economic Relations. Director General for International Economic Relations... Outside, Economic Counsellor at the Mission of Mexico to the United Nations in New York. Consul General in Denver, Houston and Corpus Christi. Ambassador of Mexico in Saudi Arabia, Jordan and Oman. He has authored several publications including "The Methodology of the Commission on Minimum Wages"; "Oil and politics", about his experience as ambassador in Saudi Arabia, "International Agenda," and a new book, which includes the collection of the columns presented in the newspaper El Universal Querétaro, "Musicalia '. * Mr. Frédéric LEFEBVRE, Deputy 1st District of French outside of France (North America) since June 2013. Former Minister. Former Secretary of State for Trade, Crafts, Small and Medium Enterprises, Tourism, Services, Liberal Professions and Consumption (2010-2012). Former Member of the tenth district of Hauts-de-Seine (as substitute of Andre Santini), 2007-2009. Member of the Regional Council of Ile-de-France since March 2004. He is the author of three books on "The best is the friend of the good" (2011), "The work today" (2012) "You are priority" (2014). Founder of Think Tank "New Horizons." * Dr. Birgitta LEANDER (Swedish) awarded the Order of the "Aztec Eagle" from the Mexican government to foreigners who have done an exemplary job. In tribute, his name was given to a School and Library in Mexico. Former Head of promotion for the "World Decade for Cultural Development of UNESCO", Paris (1988-1997). She is the author of numerous books on pre-Columbian cultures of Mexico, which is Nahuatl translations in French, Spanish, English (Nahuatl ANTHOLOGY, Birgitta Leander, Miguel León-Portilla...). Researcher Aztec codex, project «Amoxcalli» Mexico. International Consultant to UNESCO and the UN. Visiting Professor/Researcher, Mexico, USA, Europe. « Think Europe tomorrow! » : EU-Mexico relations. As Latin America's second largest economy, Mexico is an increasingly important regional and global player. Thanks to 2013's structural reforms, it is developing into a modern, competitive economy rooted in democracy and the rule of law. One of its achievements has been to establish an EU-Mexico free trade area – a major boost to bilateral trade and investment. Since 2008 Mexico has also been one of the EU's strategic partners - along with Brazil, one of only 2 in Latin America. This Partnership and the associated Joint Executive Plan have enabled Mexico and the EU to broaden their dialogue and deepen cooperation. The EU and Mexico engage in a productive dialogue on multilateral and global. The EU and Mexico are considering updating their Global Agreement, to take account of economic and political developments over the last 15 years and release the full potential of bilateral relations. EUROPEAN UNION - 2010 : 50th anniversary of the establishment of diplomatic relations with the United States of Mexico, on 30th November, 1960.